I am not ashamed to say that I was not among fast machines and hot girls during my teenage years. My father was very caring. He was afraid that I will mess up with a fast bike if he bought me one during my college days. I didn’t care to learn about the models of bikes and cars and it’s features. 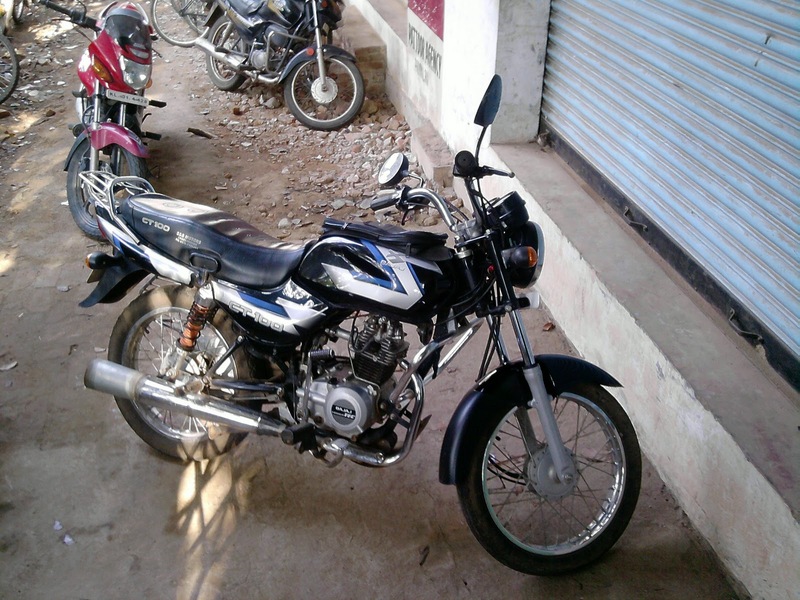 At the time of buying this Bajaj CT100 motor cycle , I had no opinion about what bike i should ride. So we just bought some entry level bike.But now i am much interested in motorbiking and have a heart to adore a real fast machine on road. I bought it in 2006.It was billed about Rs 35000 then. It was a low cost option comparing similar models of hero Honda and the rest. I did proper maintenance that year but in 2007 I didn’t care the bike well. As a result of it, the mileage decreased from about 70 kmpl to about 50 kmpl. The silencer of the bike showed signs of rusting in 2009.In 2009 I got it welded at nearest bajaj service center.So again the milage went up to about 65 kmpl.But the aesthetics were very poor.The silencer made it look 10 years more. From mid 2009 to may 2010, it was used daily for commuting to my gym. During the period of may 2010 to aug 2010, I skipped on visiting gym and so the bike was waiting for a rider.I usually service the bike every six months.Last couple of services were at the nearest bajaj service center and was below expectation. So this time I get it serviced by an experienced mechanic who ran a small bike clinic named “SPEED” in Padanilam. This guy has experience working in company/ dealer service centre. Silencer was again a problem. Rust is all over in it.So I am choosing to replace it after realizing that BAJAJ BIKES are having poor resale value and are made up of poor quality materials that cannot even last TWO YEARS. The culprit is the poor consumer who are not educated through the user guide about how to maintain the vehicle well. The mechanic is advising me to put engine oil or used waste engine oil through the rear end of the silencer. Soon it will drip to the floor from somewhere beneath the foot brakes.When you start the engine and provide throttle, the oil gets sprayed in the interior part of the silencer.Again when you are getting your motorcycle washed in a service center, water gets in to the silencer, stays there and causes rusting and disintegration. A rusted silencer = disastrous FE [mileage].So do not forget to oil it after a professional bike wash. Prospective bajaj bike owners should note that today morning I bought a new silencer from bajaj service centre kayamkulam [KAIRALI BAJAJ] for Rs 2413.Bajaj is in the business of selling bikes that has a silencer that will self-destruct even within their warranty period. Other than that, the bike is good and does not cost you much for maintenance. It’s silencer is costlier comparing to that of hero Honda bikes. My CT100 has it meters at 16600 km after 4 years of usage. I STRONGLY FEEL THAT CAR MANUFACTURERS ARE ALSO TAKING CUSTOMERS FOR GRANTED BY NOT DOING UNDERBODY COATING BEFORE SELLING THE CAR.